Click here read the latest Amistad Newsletter. HAVANA, Cuba, Feb 26 (acn) A Cuban delegation, headed by Josefina Vidal, Director of the United States Division of the Cuban Foreign Ministry, arrived in Washington for the second round of talks between Cuba and the US. According to Granma newspaper, this round will give continuity to the conversations started in January this year in Havana, on the reestablishment of diplomatic relations and the opening of embassies in the respective capitals. Vidal, along the other members of the delegation will carry out an intensive working agenda during their stay in the US capital. Havana, Cuba, Feb 25 (Prensa Latina) Cuba awaits response from the U.S. to its exclusion from the List of Promoters of Terrorism and to the banking problem of its mission in Washington, asserted here today Cuban diplomat Gustavo Machin. Deputy Director General of the United States in the Cuban Foreign Ministry, assured in a press conference today that his country awaits for answers to those issues at the second round of talks between delegations of Havana and Washington, scheduled to begin in the U.S. capital next Friday. 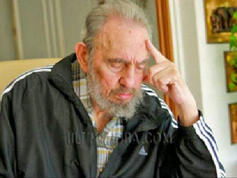 He indicated those topics are the exclusion of Cuba from the List of Countries Sponsors of International Terrorism and the solution to the banking problem faced by our mission in Washington for more than a year. In particular, he indicated, what refers to diplomatic personnel behaviour of respect to national laws and to non intervention in domestic affairs of the States. Machin highlighted the United States accepted the Cuban delegation’s proposal of July, 2014 and reiterated last January, of sustaining a dialogue on human rights. "We were satisfied because the State Department accepted our proposal of having this dialog on human rights and the delegation travelling to Washington carries a proposal to carry out this bilateral dialog on bases of equality and respect," he affirmed. Last December 17, the presidents of Cuba, Raul Castro and of the United States, Barack Obama revealed their decision of taking steps toward the reestablishment of diplomatic relations. To that end, on January 22, delegations of Cuba and the United States had their first round of talks at the Havana Convention Centre. 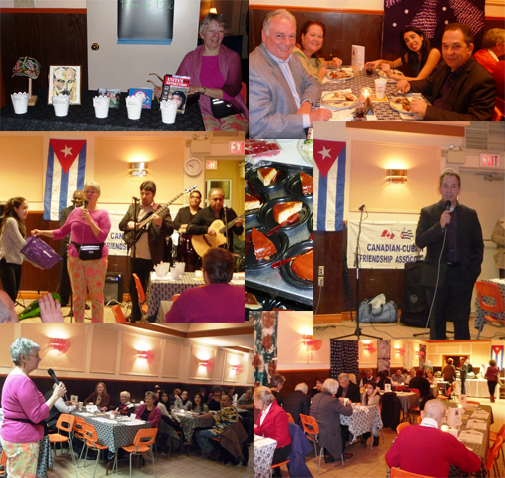 This year’s annual José Martí Dinner and Dance included a special raffle with proceeds going to the Canadian Network on Cuba’s (CNC’s) campaign to support Cuban medial workers in West Africa helping victims of the Ebola epidemic. Donated prizes included a set of Cuban Baseball cards, a baseball cap made of repurposed Cuban Cristal Beer cans, a painting of José Martí, a CD of the all women Cuban band Maquque, and a novel about Cuba, Anita’s Revolution by Shirley Langer. About $150 was raised on the raffle. The winner of the baseball cap said that it was for her granddaughter whose name was “Cristal”! The delicious dinner, prepared by volunteers was followed with a desert of creamy, yummy Cuban Flan. The diner’s spirits were nourished as well with greetings from Cuban Consul, Javier Dómokos Ruiz talking about the release of the Cuban Five and the struggles ahead. Julio Fonseca, President of the Juan Gualberto Goméz Association of Cubans living in Toronto brought greetings and support to the work of the CCFA Toronto. Elizabeth Hill, CCFA President, talked of the tradition of celebrating José Martí’s birth date, and the work of the CCFA Toronto. Liz described how it was she who had made eleven flans in just two days and how she had to place them in the snow on her back porch to cool (luckily, the neighbourhood racoons didn’t get to the flans first). As always, Pablo Terry and Sol de Cuba brought participants to the dance floor with the lively, beautiful Cuban music. Master of Ceremonies, Juan Carranza delightfully guided everyone through the evening with his humour and deep commitment and understanding of solidarity with Cuba. The CCFA Toronto thanks all of the volunteers who helped in solidarity in every capacity — from preparing the congri, to making the coleslaw, to tending the bar, to serving food and helping with the final big cleanup including washing piles and piles of dishes. Working together helps to bring people closer and build community in the true Cuban spirit! 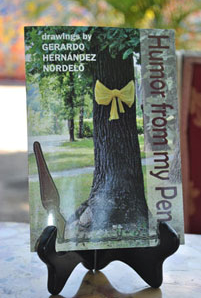 HAVANA, Cuba, Feb (acn) The book entitled “Drawings by Gerardo Hernandez: Humor from my Pen,” which includes drawings and documents related to the case of the five Cuban antiterrorist heroes unfairly condemned in the United States in 2001, was presented on Monday in this capital. It’s a compilation of caricatures I made while I was in prison, on Fidel (Castro) and various topics, as forms of expression, said Gerardo at the Cuban Institute for Friendship with the Peoples (ICAP) during the ceremony where the book was presented by Manuel Lopez, coordinator of the Committee for the Freedom of The Five in Ukraine, the organization that prepared the printing. Also included in the book, in addition to the caricatures, was an explanation on the case of the antiterrorists, the Affidavit presented at the court by Gerardo’s lawyer, Martin Garbus, and pictures of friends of international solidarity who visited him imprison, he explained. The epilogue was written by Gilbert Browstone, a friend of Cuba and president of the Browstone Foundation. The book was edited in the United States and it is being distributed by the Amazon network, Lopez informed. On December 17, after 16 years of unfair imprisonment in U.S. jails, Ramon, Antonio y Gerardo returned to their homeland and joined their families; Rene and Fernando, the other two members of the group, were released after serving their sentences. HAVANA, Cuba, Jan 27 (acn) The 14th International Congress Pedagogy 2015 starts today its discussion sessions in the Convention Palace, on a day that will include the involvement of several prominent figures in the national and international educational context. The list of those in charge with imparting lectures on this day includes the renowned Brazilian theologian Frei Betto, who will make emphasis on the importance of developing critical awareness in young people. On the Cuban side, Rodolfo Alarcón, Minister of Higher Education, will offer stock of how the integration process is in Cuban universities, while Rolando Forneiro, deputy minister of Education, will explain the working system that is used to train teachers in the island. Today, the Bolivarian Republic of Venezuela, the foreign country with more lectures, will be center of attention, as there will be a special intervention of its Minister of Education and will be developed a panel called Hugo Chavez’s Educational Thought, in tribute to the support offered by the commander President to education in the South American nation . The 1st Meeting of International Representatives on Projects for the Integration of Information and Communication Technologies (ICT), one of the most important side activities of the event will start also today. As part of the importance given to the use of ICT in this year's event, this conference will include a keynote by the Spanish professor Paloma Anton on its use in meeting the goals of Education for All Programme. Under the slogan " For the unity of educators", Pedagogy 2015 will run until today with the participation of more than four thousand delegates from 30 countries. HAVANA, Cuba, Jan 27 (acn) Vietnam´s Thai Binh Investment Trading Corp expects to build plants to produce detergent and disposable diapers at the Special Development Zone located at the Mariel Port, in western Cuba. Thai Binh representative in Cuba Tran Thien Minh told PL news agency earlier this year about plans for the year and that the new factories will further strengthen bilateral ties between the two countries. Vietnam is among 30 countries proposing investment projects for the Cuban Special Zone. “We have been at the Cuban market since 1998,” said Tran Thien and recalled that the Vietnamese company was one of the first entities of that country to establish commercial relations with Caribbean nations. In the beginning we exported textiles, shoes, perfumes and foods, but later we added construction materials, furniture, stereos and home appliances, said the executive. Thai Binh sold tiles in Cuba foro ver 12 million dollars in 2014. It is tiles that make the largest sales of that company in Cuba, according to information by that entity. HAVANA, Cuba, Jan 27 (acn) Representatives of Cuba and Spain launched a shipment of supplies to the island in order to support a solar project, sponsored by Spain´s Agency for International Cooperation (AECID). The project will be implemented in the Guama municipality, in eastern Santiago de Cuba province and it will operate water pumps fueled with solar energy. The initiative is being carried out by Spain´s SoDePaz and Cuba´s Cubasolar non-government organizations, based on solar panels provided by companies from the Spanish region of Colmenar Viejo, 30 kilometers from the capital Madrid. The project also includes solar facilities for home lighting in rural areas. At the shipment site were the mayor of Colmenar Viejo, Miguel Angel Santamarina and Cuban ambassador to Spain Eugenio Martinez, local government officials and entrepreneurs. HAVANA, Cuba, Jan 27 (acn) Spain´s Iberia Airlines will resume flights between Madrid and Havana on June 1 after a two-year interruption due to an economic slump and deep restructuring process. Iberia had interrupted its flights to Cuba, the Dominican Republic, Puerto Rico and Uruguay following a reported lack of benefits, but last September it resumed flights to Montevideo and Uruguay after reducing operational costs and purchasing A 330 Airbus planes, which provide less fuel consumption. The director of Iberia´s Communications Department Juan Cierco told reporters that they expect to be successful in their Business class due to the economic prospects of Cuba. We are very happy to have been able to organize a varied itinerary especially designed for the celebration, which we attended extremely honored to be the first Asian nation Guest of Honour in this great literary event, the diplomat said during an exclusive interview. Rajasekhar, enthusiastic promoter of cultural exchanges, was one of the main responsible of enabling the dedication of this edition, for which they are still finalizing details of what will be an intense program that will include, in addition to literature, theater, dance, crafts, food, yoga and an expected bazaar. Besides the titles that we sent to the Cuban Book Institute for translation into Spanish, a lot of books have already arrived that the Embassy has selected, will sell at an affordable price and we believe will be received with great interest, he said. He announced that 16 of the most important Hindu publishers will be in Fortaleza San Carlos de La Cabaña, traditional venue, where they will take, in English, volumes on science, math, cooking, yoga and religion, among other subjects. The India Pavilion will be the center of the literary program, everyday texts include presentations and panels, among which highlights the one on climate change with the presence of Rajendra K. Pachauri, head of the Intergovernmental Panel on Climate Change, Nobel Peace Prize. We were very honored to receive news and excited, Rajasekharsaid, that New Delhi World Book Fair is on the same days have created some challenges, but India is great and of course Cuba is special. The XXIV International Book Fair will be dedicated this time to the National Awards Leonardo Acosta, Literature, and Olga Portuondo, History, Social Sciences and Research, and when the international version ends in the capital, will spread across the country until next April. HAVANA, Cuba, Jan 27 (acn) In order to ensure the Spanish market as one of its major sources, Cuba will participate from January 28 to February 1st in the 35th International Tourism Fair, FITUR 2015, based in Madrid. The event, considered the most important in Latin America and the second with the largest worldwide reputation, according to specialized media, will host professionals interested in positioning their tourism products and strengthen ties with tour operators and travel agents in the region. To that end, the Cuban delegation, headed by Manuel Marrero, minister of the branch on the island, will attend the meeting to present new offerings of this Caribbean destination, designed for the Spanish market. According to the Ministry of Tourism (MINTUR by its Spanish acronym), the Cuban mission will update to its members about upcoming openings of facilities and services, and shall promote new projects that Cuba offers to foreign investment. At the Cuban stand, visitors can learn about the heritage cities of Santiago de Cuba and Remedios, celebrating their 500th anniversaries of founded, and the Jardines del Rey tourist pole, home of the upcoming International Tourism Fair, FitCuba 2015, which 35 th edition shall be devoted to the nautical product. Other tourist interest points of the Antillean archipelago that will attract the attention of the audience will be Havana -declared on December 2014 World Wonder City -, Varadero, Trinidad and Santa Maria, Coco and Guillermo Cays. According to a statement by MINTUR, the Cuban delegation will be also made up by María del Carmen Orellana, Commercial Director, and José Daniel Alonso, director of Business of the branch. FITUR 2015 shall also be attended by managers of hotel chains like Gran Caribe, Islazul, Cubanacán, Habaguanex, Grupo Gaviota, Iberostar, Grupo Pestana and Melia Hotels; and the agencies Viajes Cubanacan, Havanatur, Cubatur and Gaviotatours, and Cubana Airlines. 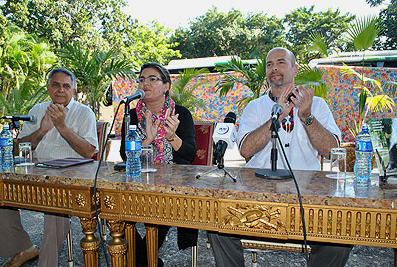 HAVANA, Cuba, Jan (acn) United Nations Development Program director Jessica Faieta announced on Saturday that the international organization will continue supporting Cuba in various projects in the economic, social and environmental fields. In a press conference offered in this capital, Faieta said that the cooperation plan began in 2014 and will run until 2018, with the objective of contributing to increase the quality of life of Cubans, the Prensa Latina news agency reported. The UN undersecretary general pointed out that her organization aims to local development, particularly production, in order to achieve the replacement of imports. Likewise, it helps in renewable energy, climate change, risk prevention and HIV-AIDS and gives attention to youngsters and to problems of gender approach, added the official. Faieta described as positive the results obtained in projects developed by the City Historian Office, which includes the restoration of Old Havana’s heritage as well as social and public services. Cuba also maintains a fair speed in other matters, like sustainable development, disaster prevention and the protection of the ecosystem, added the UNDP executive. Our programs, she said, are in line with the challenges faced by the Caribbean island, like food security, the care of senior citizens and South-South cooperation. The UN undersecretary highlighted the role played by Cuba, which contributes its experiences to mitigate complex situations like the Ebola epidemics in Western Africa and previously in the struggle against cholera in Haiti. She stressed that is also valid to underline the role played by Cuba in Latin America, particularly in the context of talks between the Revolutionary Armed Forces of Colombia-the People’s Army and the government of that country, with the purpose of achieving peace.